Confusion may set it when looking for the high-quality inversion table as this is one area that you don’t want to go wrong in. Just as there are many quality products, there are also substandard ones, so selection should be taken seriously. To help you in selecting the right one for your needs, we researched and narrowed down on 10 of the best inversion tables available online to alleviate the pain most conveniently. This stylish inversion table is designed to resemble a racing seat. One of its main highlights is the excellent build quality. It uses smart welding technology to hold its high strength steel frame together to give you a reliable, safe and secure experience. With a 3-inch foam backrest, you are assured of a comfortable experience. 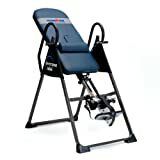 The Health Gear ITM5500 inversion table has weight support of up to 300lbs, and holds anyone ranging from 5’1” to 6’5”. Instead of the conventional tether strap angle system found in most inversion table, the Health Gear ITM5500 went for a more convenient side pin. With this, you don’t have to leave the table to adjust the angle. The vibration and heat massage pads are removable. This means that you can use the pad on other pieces of furniture such as a bed or a recliner. These pads are controlled using the handed-controller so you can control them even when inverted. IRONMAN IFT 4000 infrared therapy inversion table combines the latest infrared heat therapy technology with the traditional inversion relaxation for a number of added benefits. It is well constructed, engineered for endurance, strength, and performance, with a scratch resistant finish on its steel frame. This best inversion table by IRONMAN comes with a 2.5” padded backrest for extra comfort, and padded safety handles to allow you to return to the upright position. As it comes with clear and well-written instructions, the assembly is simple and will take you less than an hour. It supports weight up to 350lbs, and perfect for 4’9” to 6’6”-tall people. It lets you control the temperature and the angle when inverted thanks to the LED controller. The table has 3 inversion angles and inverts up to a full 180 degrees. IRONMAN IFT 4000 meets all ETL safety requirements and folds up for easy storage. Although this is one of the cheaper inversion tables, it doesn’t leave out the essentials. It may not have some of the features found in more expensive tables but as a basic model, it is more than enough. The Gravity 3000 comes with a 2.5” multi-layered memory foam pad and foam-coated safety handles for support and comfort. It allows you 3 angle-adjustments and inverts up to a full 180 degrees. Thanks to its sturdy steel constructions and a scratch-resistant powder coated finish, it can accommodate a weight of up to 350lbs. it can be adjusted for users up to 6 ft. 6” in height. Its ankle support provides secure and fast locking and unlocking thanks to the quick release handle. It folds for easy storage and has padded feet to zero-out movement during inversion. The Innova ITM4800 inversional table is perfect for you if you are tall, and comes with an adjustable lumbar pad to change into the position that you desire. With its heat and vibration massage capability, your inversion doesn’t have to take long in order to feel its benefits. The best inversion table for tall people comes with a 6-position side inversion pin to help you work with either of the six position that it allows you before you reach 180 degrees. With a gradual introduction into the steeper angles, you will be able to fully enjoy the benefits of inversion. For total comfort, while inverted, the Innova ITM4800 features the cuff style ankle support pads, coupled with round foam. As it has preassembled legs, the other parts shouldn’t be that much of a hassle and fold down for easy storage. Manufactured using high-quality construction materials, this Invertio inversion table is a comfortable, fully adjustable and easy to use an inversion table. 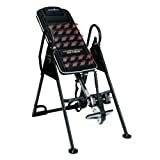 This inversion table has a heavy-duty 1.25” tubular steel construction for a rock steady and stable operation. It supports a maximum weight of 300lbs, and usable by anyone from 5’1” to 6’6” inches. The ankle support system on this model allows you to dictate the tension that will be placed on your ankles, giving you total safety and security while inverted without any pain or extra tension. If you want, you can put on and an extra pair of socks for added padding. Its inversion mechanism is very smooth, providing a gentle decline from the standing up position to a full 180-degree position. It has 8 stops which you can select from using the Invertio platform. Ironman Gravity 1000 inversion table is the base model in the “Ironman” series. As such, you would be right to expect it to be inexpensive, and not have some of the features that came with the following versions. This table is built to last as it has a strong tubular steel frame with a powder coat to resist scratches. Its backrest is made of the durable and very comfortable nylon. Though assembly is pretty straightforward, it may be somewhat difficult if you have no mechanical know-how. Ironman Gravity 1000 inversion table supports users up to 6’6” and 300lbs. its ankle lock system is spring loaded, and not easy to reach so it may pose problems for others. It, however, holds you comfortably and securely. Its inversion mechanism is smooth and has three inversion angles to select from. The vinyl covered rails allow you to move to your preferred position. It folds down for easy storage and with a weight of 46lbs, you can carry it around fairly easily. Inverts up to 180 degrees. With a weight capacity of 300lbs and a height range of 4’10” to 6’6”, this Exerpeutic inversion table can accommodate most people comfortably. It is sturdy enough and doesn’t wobble or move during use thanks to the 1.5” tubular steel frame with a powder coat to keep away scratches. Its padded backrest is soft and gives enough comfort. Thanks to the vinyl upholstery, it is also easy to clean. Its ankle locks feature, though not the best, is pretty decent and secure. For people with impaired movement in one way or another, the system on this unit may do it for them as it requires that you bend your body to lock and unlock. If you feel any discomfort, some socks and shoes are a great way out. The long handles are reachable even at full inversion, making it ideal for beginners as well. 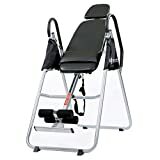 Teeter EP-560 is virtually one of the best inversion tables available in the market today, usable for inversion therapy as well as core workouts. It comes about 90% pre-assembled and features a DVD manual so assembly should take at most 30 minutes. Unlike the aforementioned, instead of the common stainless steel, this table has carbon steel construction that lasts a very long time. It is great for beginners and experienced users as it is very easy to understand and use. The ankle support snugly fits around your ankles and feel comfortable thanks to the pressure-reducing foam and the comfort dial. Teeter EP-560 inversion table has a smooth, easy, and comfortable inversion process. On top of that, while inverting, it allows air circulation for the back. When folded, it is very compact, and can be stored behind a door or in a closet when not in use. Being an improvement of the Gravity 1000 discussed above, the Gravity 4000 inversion table is reputable for its effectiveness and comfort. It has an extra-wide heavy-duty steel frame with anti-scratch powder finish giving durability, stability, and security during inversion. Its vinyl covered backrest is padded with memory foam for comfort. Additionally, the removable lumbar pillow supports your lower back. You will have the unit up and running in 30 minutes thanks to the detailed instructions. Thanks to the easy-to-reach palm-activated ratchet type ankle locking system, you will bend less when adjusting the ankle supports. The Gravity 4000 has three inversion angles and a very smooth inversion process, with extra-long handles to pull yourself to the upright position. It is somewhat heavy, coming in at 75lbs, folds down for easy storage, and has rubberized feet for stability. The Innova ITX9600 inversion table has a “true balance” system that simplifies inversion. It is heavy duty and can support up to 300lbs measuring 4’10” to 6’6”. It has an extra-long and wide backrest and a heavy-duty steel construction, making it stable and sturdy. This best of the best inversion table stands out because instead of using a strap to adjust the position, it uses a simple pin system to prevent slipping. It is super simple to operate and gives a consistent inversion every time. The heavily padded vinyl coated backrest and thick foam leg make it very comfortable, something that you wouldn’t expect at its low price point. It offers you three inversion angles and a very smooth movement. Assembling it is simple, further simplified by the handy instruction manual in the package. Within about 45 minutes, your table will be ready for your first inversion. Additionally, being lightweight than most, it is simple to carry around, and fold down flat for convenient storage. If you meet any problems during use and/or installation, there is a very responsive customer service to assist you. There are a couple of things that you need to check when selecting the right one for you from the above. The one you select should well be within your budget, and you should check its weight limit. You don’t want to end up with a table that feels wobbly as you use it. You won’t get the health benefits and it could pose some serious risks to you. Also, you should also know the angle of motion and whether or not it comes with a vibration pad. With these in mind, you will find the ideal table from the above. Controlled inversion: you should be able to know whether the inversion degree of the inversion tables you intend to buy is controllable since a lot of commodities will be able to offer this feature. If you intend to begin an inversion therapy then you should ensure that you are able to deliver your work gradually and perpendicularly to avoid having any effects such as dizziness. With adjustable inversion degree, you are able to keep calculations of your work at your convenient time. Space: the amount of space that the tables take upon is one thing you should be able to consider since if you need perfect stability and durability of your work then large frames are ideal choices you should have. You should ensure the table frame of your inversion table is constructed in a way that it is durable and can last long so as to guarantee maximum security. Some of the tables are meant for other purposes and in this case, you should be aware that some of the other products are flexible and should be able to have a secure place for storage. Ankle locks-it should be able to have an ankle locking system to ensure that you are secure when inverting. Vinyl side covers-these covers help to prevent your fingers by preventing them from any sort of crush between the table bars while inverting. Steel frame-they are able to withstand any sort of conditions since they mare durably made. Floor stabilizers –this helps to prevent the table from skidding. Comfort: your table should be in a way that it best suits you and gives you the comfort that you need. The ideal tables that can guarantee you much comfort are those that come with thick pads. Sometimes the kind of the inversion table you intend t0 have should be able to consider health conditions for any person who intends to use the table. Comfort may be the last option for your choice but you should ensure that you take keen consideration since without a good comfort you may find yourself not using the table at all. Frame quality: you should be able to look for tables with steel frames and non-skid floor protectors. The steel frames will be able to withstand extensive use and the floor protectors will help prevent the table from skidding across the floor during use. Tables with larger frames are more stable and may not be as portable as other models but they are durable and lasting. Make sure that you inspect well on the material in which the table is made of and how much weight it can withstand or handle. You should also ensure that you choose a table that can withstand a large amount of weight. The price and manufacturer: before you go for any table you should be able to consider the manufacturer and the cost. Get yourself a model that is able to last and that is from a reputable manufacturer. Do not go for cheap inversion tables as this may lead to you having to lose your money in the long run. Make sure that you have all your calculations clear and in a procedural manner to also avoid on going out of your budget. Do good research of the product and find out more from other customers and be able to evaluate their opinions as this will greatly help you know what you want and the type of budget to go with. Benefits: a good brand will have an inversion table that has built-in features to provide you with a lot of benefits during your work-out session. Smooth table bed surface enables you to have ‘a good stretch and reduces the back pains. Stress relief: there are lots of stresses in life which are not good for your life; the inversion table will be your perfect stress reliever as it will act as a therapy tool. The table will help you connect your mind with the body when you’re alone making your mind to relax hence relieving stress. When you have a relaxed mind then the body muscles to relax eventually. Body detoxification: when you let your body hung upside down then a perfect treatment of your body is enhanced and also detoxification. When you use the table in a good way it will help to improve the circulation of your lymph nodes in the body and the pressure onto your heart is reduced with a good supply of oxygen into the brain. Healthy spine: the inversion table will help improve on your muscles and enable the bones to be in place. It also helps to reduce pressure in the joints and bones so that you can be able to deal with the compression. Your joint cavities will have good lubrication since the compression has been reduced by the use of the inversion table. Improved circulation: the inversion table in use helps you to hang upside down making the flow of blood to the heart and all other parts of the body to be efficient. Increased flexibility: the much time spent in the table enables the stretch of your muscles in healthy ranges which in return will enable you to have a flexible body. Maintained posture: the inversion table will help you to improve on your body posture by hanging on the table upside down for a short period of time and without much exercise. 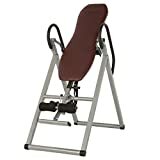 Quick recovery: if you have had a busy day with a lot of stress then this inversion table will help you reduce the stress on your bones and the stressed muscle. It helps in the quick recovery of muscles so that they can perform to their maximum potential. Anti-aging effects: the inversion table will help you stay young; your body system will be improved hence having a less degeneration occurring because of toxin build-up. The properly flexed muscles will enable your skin to stay tight and well stretched. Saves time and money: the daily exercise that you do with the inversion table helps you save on time and money. The inversion table assists you to avoid spending on some costs such as paying for costly treatments and surgeries. You are able to do some saving on your money that you can use on other things. Relieve pain and manage it: the inversion table helps you to cure the pain related to the back. The painful nerve pressure will be relieved and with the less pain, it will be easier for you to have a peaceful sleep. You should be able to invert one to two minutes and slowly advance to more minutes as you feel completely well. What makes it outstanding is the frequency at which you invert is what is more important not the period of time in which you invert. At times when you are working out ensure to work out like three to five minutes until you feel that your muscles are completely relaxed and released. The inversion table will be able to help you with your body fitness so you should ensure that you routine if inverting with a Teeter plenty of times during a day is consistent to enable you to have a good result. Your comfort is always the key thing while using the inversion table, the vibration cushion helps you to temporarily relieve muscle tension in you and improve surface circulation. If you are a beginner then you should ensure that you go through the advanced users that comes with a guide in each Teeter as this will enable you to exercise in with caution and be able to adjust with time. You should also be able to add Acupressure Nodes to your Teeter to enable it to have a good pressure-point relief which will help you greatly to relieve any sort of muscle discomfort and improve circulation in your body with a release of tension during inversion. If you may need to invert for a long period of time and want to use the Teeter one of your exercise station then you should link the Gravity Boots with Adapter Kit with your inversion table to give you firm support and enable a wide weight distribution. For the starters, you need to discuss your inversion therapy with your doctor before beginning on the usage. You may have a disease that may not be fit for you to use the inversion table as it may affect your blood pressure in one way or another. You may want to have a good experience with the use of the inversion table but in one way or another, you don’t know how to use the table worry no more because here are some of the tips that will help you get started with your new inversion table. Have someone close to you when you start out so that if you may feel like getting any kind of help or run into other issues using the table then there is someone to help you. Make sure that the positioning of your table is good; it should be on a flat surface and very well assembled. Each time that you make use of the table be keen to check whether everything is in place to avoid unnecessary injuries. Adjust the table to a position that will fit your height so that your head can lie comfortably on the table if not then do more adjustments till the inversion table best fits you. Remember to use the instruction manual to make the correct adjustments in your inversion table. For you to be able to pull yourself upright while using the table, make the use of the handles or straps. This should be done in a slow manner to avoid getting tired and feeling dizzy. This straps should be comfortable and in any case, you feel like you are not comfortable to attend to them before you invert. Always don’t forget to relax and take deep breaths because the whole idea of you being upside down is a new thing for you and you may feel stressed out. Raise your hands above your shoulders to allow your spine to fully stretch and a good spinal decompression. Get into position and lift your feet one at ago as you place them on the steps. Make sure that the feet are secured well according to the manufacturers’ instruction and the straps are secure before you begin to invert. Always wear proper clothing and ensure that you are in shoes when using the inversion table. Some of the shoes that are good to use are the athletic shoes as they will secure your feet well.